"We're an unselfish team. We move the ball. We share the ball and we play together," Ingles said as the Jazz had 31 assists and shot 55.8 per cent from the field. "We've never worried about someone shooting too much or not enough." Gobert's alley-oop off a lob from Donovan Mitchell in the second quarter was his 270th dunk of the season. The 7-foot-1 centre's 275 dunks are the most in the NBA since the statistic started being tracked in 2000, besting Dwight Howard's 269 slams in 2007-08. Booker's shotmaking had the Suns only down 14 entering the final quarter, but Utah's dunk-fest continued, even though Gobert was on the bench. 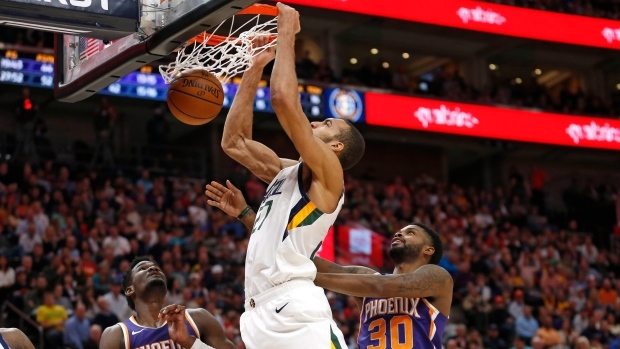 Favours had two jams around a rare dunk by Ingles and the Jazz cruised from there.